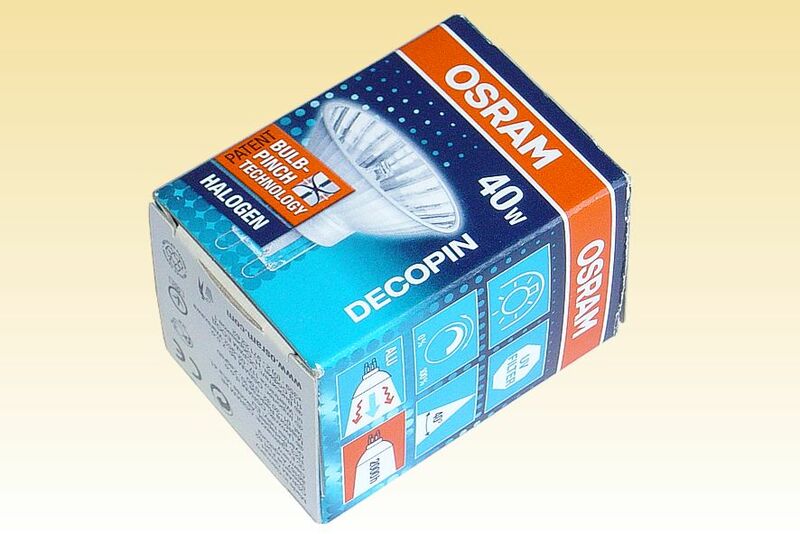 Introduced in January 2006, Osram's DecoPin makes use of intelligent design to reduce the halogen reflector lamp to the most simplistic form possible. 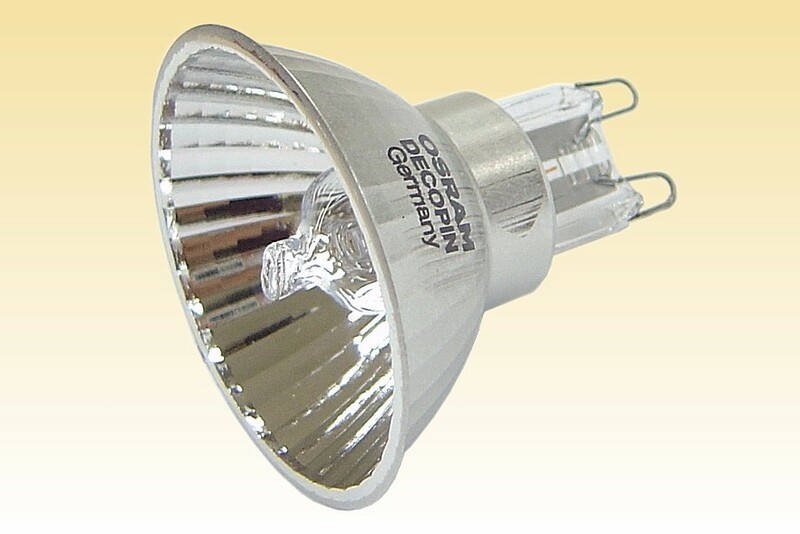 Floating in at a mere 7 grams its mass is less 15% of its nearest competitor, the GU10 mains halogen lamp. 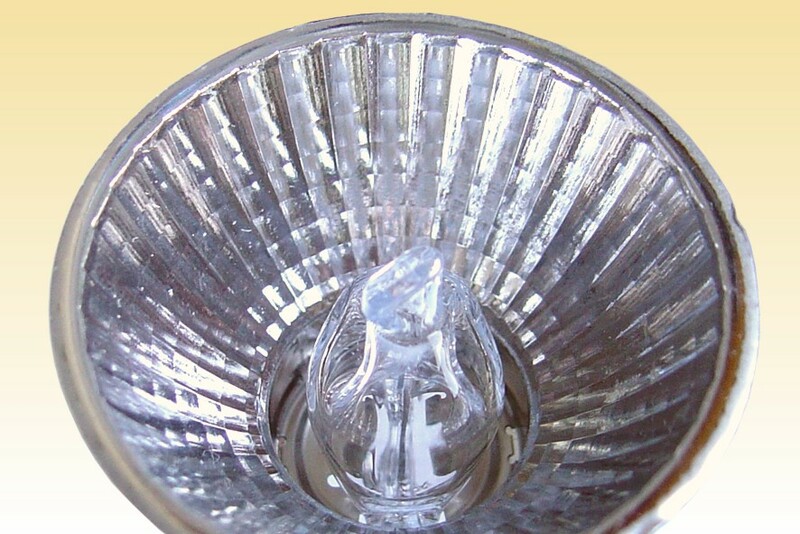 It has no base, no front lens, no adhesive cement, in fact many traditional lamp components have been eliminated through its clever construction. 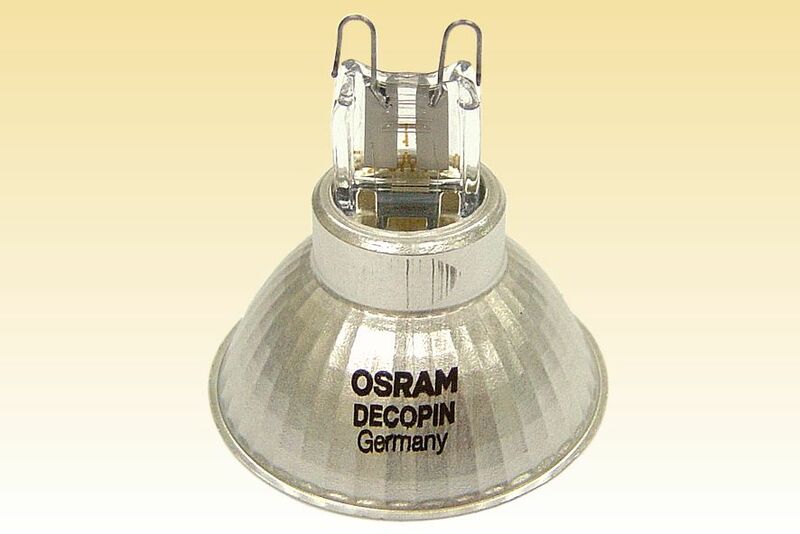 Most of this capability stems from the unique properties of the G9 capsule at its heart, another Osram invention. The pinch-seal forms the electrical and mechanical connection with the holder, so no additional base is required. Thanks to its low pressure design and integrated fusing, the risk of an end-of-life explosion is practically eliminated. Together with the use of UV-block quartz this means that a sealed system with a glass front lens is no longer necessary. The aluminium reflector is unusually thin, and the capsule is fixed rigidly with a small spring-steel clip. 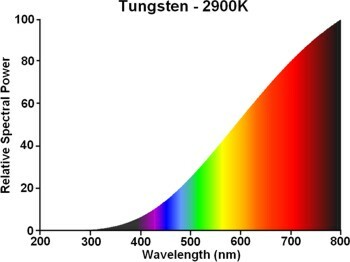 Optical performance however leaves something to be desired, as the lamp is not especially efficient at collimating the light from the filament into a well-defined beam. The twin-pillar filament arrangement means that no part lies on the focal axis of the reflector, and the result is a beam having a figure-of-eight shape. Also of the 490 capsule lumens, only about 350lm is focussed into the forward beam. It lacks the efficacy and optical precision for professional applications, but makes a good fit with domestic applications where form is more important than function. Since its launch it has found limited success in applications such as picture lights, but so far has failed to usurp the dominance of the GU10 alternative. Max. Overall Length: 43 mm 1¾ "